When Unmasked, Who Will You Be? 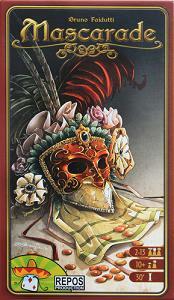 Attend a Mascarade of the renaissance and try to discover the identity of your opponents. Who is telling the truth? Who is bluffing? Reveal the truth all while hiding your own true identity! The goal of the game is for players to gain the most gold pieces that they will amass either by telling the truth, or alternatively, bluffing. Players each receive a Character card, that they will switch, or not, with their opponents throughout the game play. At each turn, players have the option to either announce who there are, and therefore are able to activate the power of that Character, as long as none of the other players challenge them; to secretly look at their card; or to swap their card with another player.